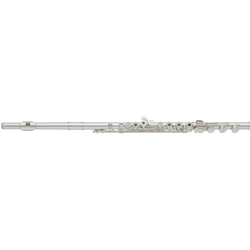 Sterling Silver Headjoint, Body and Footjoint - Sterling silver provides a beautiful sound with warm resonance. An undercut and beveled embouchure hole is specifically designed for a clean attack, sensitive response, and accurate intonation. The nickel silver, power-forged keys are very durable and less susceptible to breakage. The neoprene key bumpers are stronger and more durable than cork. A unique footjoint alignment mark facilitates proper fitting by young players.